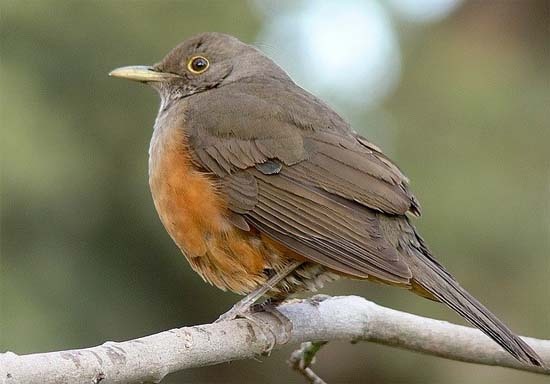 All this talk about nightingales in the previous posts has brought to my mind what could be considered their equivalent at us, around the Rio de la Plata: the zorzal (Turdus rufiventris, rufous-bellied thrush). 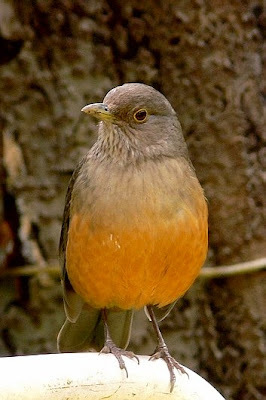 The zorzal is undoubtedly the best known songbird in the Rio de la Plata Basin. Just like the nightingale, it has a very melodious song and it is heard specially between night and dawn, in springtime, when the courting and mating season begins. In cities, many zorzals are to be found in harmonious coexistence with humans. And in the springtime, that is between the months of October and November, many porteños, even those who know nothing about ornithology, begin to identify it as the bird which makes them wake up at dawn. To tell the truth, however charming the zorzal be, I can vouch that its penetrating and repetitive call at night can be unnerving for a light sleeper. Like the mockingbird and the nightingale, the zorzal does not have one unique song. It varies not only according to the season of the year, but also according to the geographic zone and even from one individual to another. This is due to the fact that they imitate the songs of other birds, so that on occasions they create very particular “remixes”, even imitating the noise of motors, windmills or bells that were near their nests, thus puzzling many an ornithologist. Moreover, the song is the males’ weapon of seduction, so that while some individuals are very young and inexpert, others are mature and own a wide and proved repertoire of complex songs which have already afforded them successful conquests. The zorzal is such an emblem of a melodious voice that Carlos Gardel, the most famous tango singer of the last century was known as “El Zorzal Criollo” (“The Creole Thrush”). The two tangos that Gardel sings here are classic and very well known (even by those who, like myself, know nothing about tango). Many lines of these songs have become standard sayings, proverbs and aphorisms. They are also very good examples of the use of lunfardo porteño, the argot of Buenos Aires, which probably few Spanish speakers from other regions are able to decode without difficulty. The first tango, “Mano a mano” (We’re Even) tells of a woman who, being of humble origins, now considers herself a “bacana” (a wealthy person who puts on elegant airs). In former times she accepted the singer’s love but now she holds it in contempt, because she has a rich “otario”, (a sucker, a fool) who keeps her and lets her throw “morlacos a la marchanta” (money around). He therefore speaks up with the intention of warning her that her vain illusions, her ephemeral triumphs will not last long and will soon leave her “like an old, unstuck, piece of furniture”: forgotten and hopeless. I think we agree that this is the discourse which all of us spited by unreciprocated love would like to inflict on those by whom we have been forsaken. Al least, it is a feeling that well depicts a porteño: if something makes him suffer, he will always try to show to the other that he is beyond insults and contempt because he “knows” that the other will end up worse than himself. you were just a good woman. like you’ll never love again. your girlfriends and your beau. what you do now, or what you’ll do. I’m sure I’ve already paid for. on your current sucker’s account. 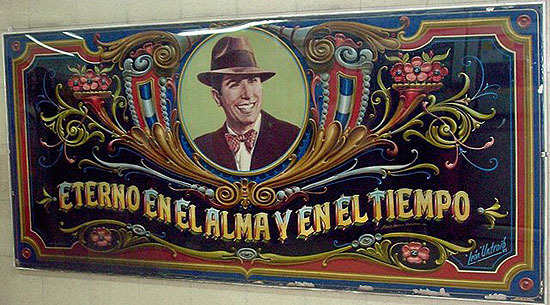 This other tango, also very famous, is by Enrique Santos Discepolo, a great porteño musician and poet. As it can be seen, it exhales nothing but bitterness and skepticism, a vision of life very typical of tangos and particularly characteristic of Discepolo, also the author of the well known “Cambalache”: “El mundo fue y será una porquería/ ya lo sé, en el 503 / y en el 2000 también” (“The world has always been and always will be trash, / I know, in the year 503 / and also in 2000”). We again find the singer who assumes that he possesses supreme knowledge and therefore warns his listener to harbor no hope because it would be in vain (it’s remarkable how we porteños are defined by this image of the know-it-all…, I want to believe that not all of us are so, but its presence is constant in popular beliefs). Everything is a lie, nothing is love; nobody cares about what happens to the other and no one will help you when you are in need. He knows it because he’s already been through it and he knows about “rajarse los tamangos buscando ese mango que te haga morfar”, wearing out your shoes in search of money with which to eat. So when the other gets to realize that those around him are preparing to step into his clothes when he fails: “manyés que a tu lado se prueben las pilchas que vas a dejar” (manyés, ‘realize’ is another argot word that comes from the Italian, mangiare, to eat, because when you become aware of something it’s as if you ate it, you incorporated it spiritually), he will remember the warnings that were made to him. But perhaps the most interesting aspect is the image with which the tango begins on which all the subsequent development is based. “Cuando la suerte, que es grela”, that is, ‘luck, who is a woman’. Since ancient times luck, opportunity or fortune has been represented as a woman, and here is important not only the tradition of representing vices and virtues with allegorical feminine figures, but also the supposedly changing moods attributed to women or, what is more admissible, their changes of status, like those of the moon. Opportunity or fortune was therefore represented as a woman on a wheel or a sphere, because she is never stable, she goes turning and thus changing the fortunes of men. This is precisely what the tango suggests by saying “yira, yira”, that is, it goes round and round, (with another contamination by the Italian girare). But “yiro” was also the name given to prostitutes in lunfardo, because they wander around (yiran) corners of the city in search of clients. We have then the concept of luck that’s a woman, that lets you down (“fallando, fallando”) and leaves you without what you have expected of her (“Te largue parao”). Fortune goes round like a prostitute and she IS a prostitute. And this is the image of the world which has nothing stable or sure, except this bitter truth. of the deaf and dumb World. But maybe the voice of the “Creole Thrush” is best appreciated in the famous “El día que me quieras” (The Day When You’ll Love Me), which isn’t a proper tango but a tango-ballad. It was composed for the movie by the same title in 1935. Leaving aside the flamboyant gestures and acting of the two leading characters, the matchless melody and the poetry, which is perhaps somewhat kitschy but nevertheless enchants me, is one of our national prides. 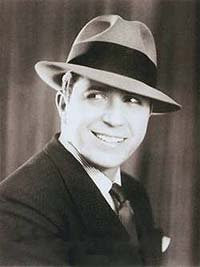 Music: Carlos Gardel. Lyrics: Alfredo Lepera. by the light murmur of your sighs. if your black eyes are willing to look at me! will ring out that now you’re mine. will tell me of your love. who will realize that you’re my solace! pain will not exist any more. "Y en zorzal su voz ... ella es asi! " - yes, comparing with a nightingale would make it ring for us Europeans! Thanks for the argot excursion! I'm really curious about comparisons between the Guardia Vieja's lunfardo and the latter-years "lunfardo reenactment" of D'Arienzo / Weiss ... when the argot emerged from the onstage ban but now probably more like a theatrical prop rather than a live language. Still it cuts right to the national character either way. Carton Junado etc. Any interesting thoughts / observations? Just revisited this post after coming across a post about Carlos Di Sarli's "Zorzal" milonga and its beautifully singing character who has gone to the stars. Isn't it wonderful to have old poetic links of this blog? Happy March 8th to you, Julia!